If Victor Licata is innocent, as is the supposition of this book, then this begs the question. What really happened? Here in this chapter, we present some possible (and very plausible) scenarios of what some of us feel really happened. 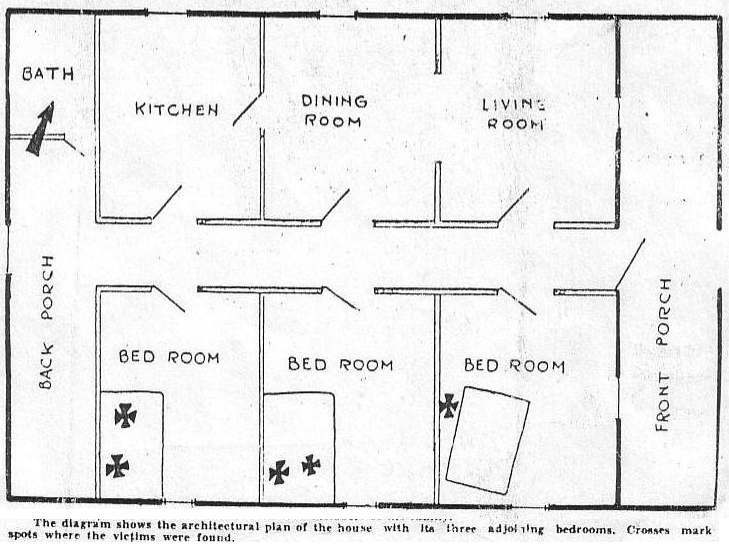 However, before getting started, it might be useful to once again go over a layout of the Licata house. Note that it shows three bedrooms, however according to Zillow.com (a real-estate website), the Licata house (1707 E. 5th Ave, Tampa Fla.), which still exists is now listed as having four bedrooms. And in all likelihood it had four bedrooms even back then. The forth bedroom (probably shown above as either being the Living or dining room), being the one in which both Victor and Anthony (who was away at collage) both shared. Also note that the “Back Porch” area (along with the bathroom), was physically located INSIDE the house itself. However, the front porch is opened and part of the outside of the house. NEXT -- Let us look at a time line of events. Noon Time – During the day Victor goes and tries to borrow a pistol. At a later time that day he goes off to work, delivering moonshine liquor. 7:00PM – Sunset, the sun goes down on the Tampa Area. 12:00 - 2:00 AM (night) – The Murders take place. Several of the neighbors claim that they hear some strange noises during the night. However, if there is one thing that we have all learned so far, and that is to doubt anything CLAIMED to have been said about the case. In the above example, one has to ask ones self; ‘How did this quotation come into being? To our knowledge NO REPORTER actually sat down and interviewed Victor himself. [17A] Thus the quote had to come from . . . ??? What actually happened that night? How did it come to be that Victor Licata was found inside a locked house with a bunch of murdered bodies all around? Keeping in mind that Victor Licata was mentally autistic, and in all likelihood in a state of shell shock at the time. Below we list several scenarios, (the most likely ones), that serve to explain what actually happened that night. 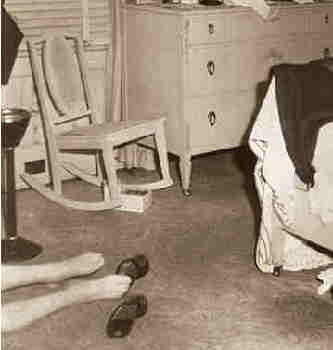 Simply put, Victor came home late that night (drunk as a skunk) didn’t notice the murders and simply went to sleep. The next morning he woke up real late, went to the bathroom, cleaned himself up, put on clean cloths and only after that did he notice that something was wrong. In our opinion, this is exactly what actually happened. Let’s begin by looking over a sketch of the house. [see sketch above] Note that it shows only 3 bedrooms, however according to Zillow [17B] the property today has 4 bedrooms, and in all likelihood the house had been subdivided back then to also have 4 bedrooms. Additionally (given the family size and ages), in all likelihood Victor had been sharing this fourth bedroom with his older brother Anthony, who had the luck of having left for college a few weeks before the murders. Thus Victor would have had the whole thing to himself. And if he came in very late that night, it would have been real possible for him NOT to have noticed that anything was wrong. In addition, we should look at his activities the day/night just before the murders. By numerous accounts he had been on a moonshine run during that time -- essentially riding in the back or the front of a liquor truck making deliveries. ---- Obviously he had sampled some of his wares to a high degree. MUSEUM NOTE: At this time Alcohol prohibition had just ended nationwide, but was still not yet fully legal and licensed within the state of Florida. --- Simply put, what Victor was doing, can be considered an illegal activity. Which would explain his reluctance to tell the police who and what he had been doing just prior to the murders. And it would also account for some of the statements told to Earl Rowell by the local police, -- in effect, Victor Licata (and his father by implication) were engaged in activities outside of the law. “. . . Victor, by his own story, returned to his father’s home some time between 8 and 10 O’clock Monday night. His father was at his barber shop. His mother was working in the kitchen. Providence, his sister, was out. 14 year-old Phillip and 8 year-old Jose were in bed. Victor himself, if he followed his customary habits was “charged to the skies” on marijuana, sodden in moonshine liquor. For hours before he went home he rode on somebody’s truck---a liquor truck, he said---but he refused to name his companions. . . Here, the claim is that Victor got home around 9 or 10PM that night -- Our scenario would have called for him to have come home much later. However, the article got so many other things wrong that it is possible to ignore these statements (allegedly made by Victor while in Jail). – also see scenario No. 3. In this scenario, Victor Licata (who was said to be a musician) was simply at a nightclub and just simply came home real late that night. The rest of the story pretty much follows scenario No. 1. This scenario is doubtful however. While plausible, it becomes obvious that had he been at a nightclub that night, he (or someone else) would have made mention of this fact and thus have given him an alibi. This scenario is also very plausible. It runs similarly to scenario No.1, except here he got home a lot earlier (say around 9PM), but because he was drunk, he simply went to sleep. Recalling that he slept in the improvised forth bedroom, it would have been possible for him to have been totally ignored by those who murdered the rest of the family. Obviously there are various takes of the above three scenarios, and probably numerous other plausible ones that can come to mind. But in general they all follow (with some minor changes) the three listed above scenarios. 17.2 – WHO COMMITTED THE MURDERS? As already described in chapter 8, there were a lot of people, who just plain didn’t like the Licata family all that much, --- many of them big name players. As for Victor himself, he was probably only nineteen or twenty years of age himself, but let’s be frank, a lot of mentally autistic people have problems relating to others, so it can be assumed that Victor didn’t have very many close friends. However at the same time, due to his family ties, he probably had a lot of acquaintances. Example, whoever he was riding with in that track delivering moonshine that day probably would fall into that category. Thus the Licata Family had a lot of enemies, while Victor himself had very few friends. Example, why didn’t whoever he was delivering moonshine with come forward and declare himself as an alibi for him. Or (assuming one accepts scenario 2 above) no one who was in that nightclub that night came forward to speak up in his defense. However, disliking someone is one thing, MURDER is another. Which fortunately for us, (realistically speaking) limits the number of possible murderers. This scenario is as follows: --- A long wolfish predator; the same man who had murdered the Rowell family, and next the Mildrid family, now stalked the Licata family. The night was hot, very hot. In fact this would be the warmest Oct 16 ever-recorded in the history of Tampa. Thus (with air conditioning not yet invented) the fiendish predator knew that the back door would be left half opened to allow the fresh air to come in. Without trouble, he entered, axe in hand, ready to do his evil deed. Slowly, with his cat like walk, he went in and then . . . etc; leaving out the dog, the rest of the story pretty much follows the Inside Detective magazine version. However, here at this point the author of this book has a confession to make. Although it was the fact that there was a serial axe murderer loose in the streets of Tampa at the time (and there was one). I now believe that it was NOT a long axe murderer that committed the Licata family murders. Why? In answer, let’s look at both sides of the coin. The M.O. was the exact same (murders were committed in the middle of the night), while the family slept. Also the same kind of weapon was used, and the blows took place on the exact same spot in all the family murders we have been able to come across. Now granted, the last (big time) family killings that occurred, took place some 6 years before. But here we must also remember that there was a lot of publicity surrounding that family's murder in 1927. 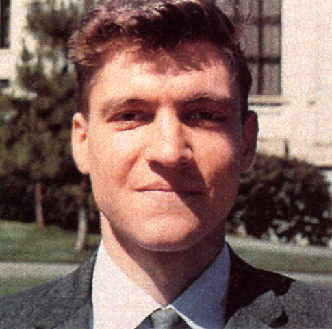 Possibly Ted Kaczynski, (the Unabomber) can explain why he (the axe murderer) took a hiatus. In his own case, after a secretary witnessed the Unabomber placing a package near her car in a parking lot in 1987. She was able to help an artist draw the now-famous sketch of a man wearing a hooded jacket and aviator sunglasses. 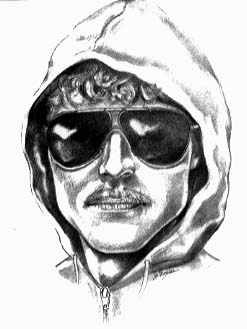 After the sketch was released the Unabomber stopped bombing for six years. We assume that fear played some role. Given the publicity surrounding the 1927 axe murders, it is also possible that (out of fear), this axe murderer also stopped his actions for the same period of time. Granted as the Licata murders had the same M.O. (Modus Operandi) as the other axe murderers and the lone axe murderer theory is quite plausible. HOWEVER there are some problems with the lone axe murder scenario. To begin with, had he (we assume it’s a guy), just randomly picked a house, it would have been very hard for him to have gotten away with it had he not first cased the place out. For instance: What if there was a dog, wouldn’t it have started barking right away? Unless he was a locksmith, how would he have gotten inside a supposedly locked house in the middle of the night? How would he have gotten from his car (we assumed he parked a few blocks away) and walked through the streets to the Licata house carrying an axe? --- As the reader might guess, the logistical problems associated with the lone ax-man theory are endless; none of them are impossible to overcome. But as the reader can surmise, the obstacles to a successful kill would have been many. Then there are other factors that weigh against the lone serial murderer theory. If one were to believe the newspaper accounts, one of the neighbors heard the noise, went outside the house and shouted to the people inside. Most lone murderers would have panicked (thinking that the neighbor would next go back to his house and call the police then and there) and immediately try to run away. This one seems to have played it cool, kept quiet for at least thirty minutes before making the get away. Then there is the question of why the murderer would have locked the doors on his way out? And last of all, (while the M.O. was the same as in the other axe murders), still it should be noted that at the time, bludgeoning deaths were the trademark of a Mafia hit within the Tampa area. A brutal way of letting people know that you don’t play around with the mob, etc. Many people think of white supremacists as being a bunch of half-witted morons, who spend most of their lives chopping salami in a back room somewhere. People who were it not for the grace of God, they wouldn’t even know how to tie their shoes on properly. However, the reality is somewhat different. Take a look at Harry Anslinger (no lover of black people he), was he a half-witted moron? Could a half-witted moron have orchestrated the Reefer Madness campaign? Logic and reason alone would dictate that many groups like the Klan WERE NOT started, nor run by idiots. Somewhere along the line someone with some brains had to come along -- In fact the Klan itself serves as a good example. In 1895 the “Separate But Equal” doctrine was adopted by the U.S. Supreme Court. Woodrow Wilson became President and allowed for/supported the creation of the Jim Crow Laws. World War I, created a pro-American atmosphere that did not allow for decent. Alcohol Prohibition (1920) created support for the Klan, which was in favor of American Values, meaning prohibition. While the 1920’s saw a great rise in economic prosperity, it also brought in large immigrations of Catholics, and Mexican’s which were resented by many. 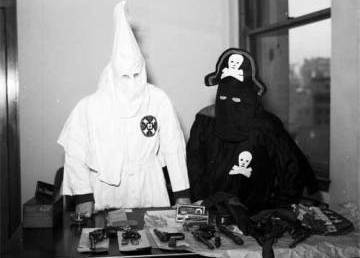 In November of 1935 (just two years after the Licata Murders), members of the Tampa Police Department (without an arrest warrant) broke into a home where a group known as the Modern Democrats were holding a meeting. Three members were taken to jail, where they were interrogated about their Communist activities and then turned over to a mob of individuals (who just happened to have been there). The mob kidnapped them (right in front of the police station) and took them to the woods where all three were flogged, beaten, tarred and feathered etc. Two of them made it back to Tampa, but Joseph shoemaker wasn’t so lucky, he died of his wounds, BUT NOT BEFORE identifying who had done it – which included members of the Tampa Police department. . . up to this point, the Roosevelt administration, which needed the support of the dixicrats for their agenda, had been looking the other way when it came to the activities of the Klan. However, the bad publicity from the Joseph Shoemaker affair finally forced Roosevelt’s hand. Which in turn forced Florida officials to bring indictments against five (former as well as present) Tampa police officers [C.A. 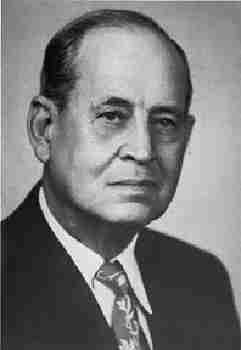 Brown , John P. Bridges , C.W. Carlisle , Sam E. Crosby , F.W. Switzer , and Robert L. Chappell], AS WELL AS IT’S Chief of Police at the time R. G. Tittsworth. In other words, they got away with it – that was how strong the Klan was back then. And it should also be noted that two star witnesses were both said to have committed suicide. -- Police Sergeant Carl Tompkins (who jumped out a window), and Robert P. Fariss (who was found dead in his automobile). Now, where does Victor fit into all of this – Well Victor (while he was white) was not an Anglo, he was not Protestant, was a moonshine whisky runner, and (how shall we say it) ---- just didn’t fit in to the Klan’s version of all things American. Worse of all (looking at things from the Klan’s viewpoint) the Licata’s were prominent members of their community. Especially Phillip Licata (the brother of Victor's father); But how to get at him? If your purpose is to terrorize, to keep people in their place, then you can’t just send someone a dirty letter. You have to do something to inspire fear within the community, which made the Licata’s especially vulnerable. Thus killing his brother (Victor’s father) as well as his whole family --- in an extremely brutal way, would serve that purpose. Two uniformed police officers pull up and tap on Mike Licata’s door. Mike being in the front bedroom at the time, opens the door and allows them to enter. The small talk quickly ends as a couple of others enter the house (with axes), the two dressed as police officers have by now drawn their guns and order Mike Licata back into his bedroom. --- The two axmen start their work. The screams wake up the rest of the family, but they are told to go back to their beds by the police officers with smiles on their faces. Don’t worry, we have this well under control. The axmen then continue their handiwork (one bed room at a time). Then panic, the next door neighbor starts shouting, “Hey, Mike are you ok?” However, the two axmen are professionals, and simply (through signs) tell the two policemen to keep quite. After a few minutes the neighbor goes away. They wait yet (around 20 minutes), --- yes there is some fear, although this was planned for (a triple "K" member was to be on phone watch at the station that night). BUT what if he calls the sheriffs office instead? How would they explain things? But nothing happens and after a half hour (to make sure the neighbor is back asleep), they all simply leave. Should anyone out there see anything, by all appearances it would look as if the two axmen (one of who leaves his axe behind as an intimidation tool), are being escorted to jail by the two officers. BUT in the confusion, the murders have totally ignored Victor (who was so drunk he slept through the whole thing), in the forth (improvised) bedroom. First, and most important of all, ---- NO, no one is saying (or even implying) that ALL Americans of Italian heritage are members of a criminal element. If anyone needs proof of that, just look at the fact that before Al Capone became a household word, many of the big name criminals had Irish sounding names like ‘Baby Face Nelson’, ‘Machine Gun Kelly’, or ‘Willie Sutton, etc. In addition anyone who has done any studies into the ’Gangs of New York,’ knows that they were primarily made up of Irish Americans. So does that mean that ALL Americans of Irish decent are members of criminal elements? In general (the author for one) feels that the Italian community just got a bad shake from the news media. Too much ‘Eliot Ness and His Untouchables’ on television and not enough good stuff to counteract it. If it helps any (if you are of Italian decent), African Americans are now also getting that same bad rap. Thus we must at least take the Mafia factor into consideration. After all the Licata's were prosperous and as we have already seen the house Licata was at least involved in the moonshine business, etc. And then there is the fact that Victor's father's brother was involved with the Italian Government (a perfect place to make high level enemies at the time) and you have the perfect ingredients of murder mystery. One that even Agatha Christie would be proud of. And there is yet one other factor that must be added. At the time, it was customary for Mafia hit-men (aka assassins) to use axes, clubs etc, for added emphases; --- As a sort of warning to others not to mess with the Mafia etc. Note that his death scene (an obvious Mafia hit) closely resembles that of Mike Licata. And it is also interesting to note that according to Dr. R. Murray’s book, “First But Not Last p20” Dr. H. Madison Smith’s wife Justine (before she married him) worked at a law firm own by the brother of Charlie Wall. She even had occasion to run into him out on the street etc. Coincidence, probably, but a Mafia hit on the Licata family could easily explain many of the missing pieces. It was around 1:00 AM when Mike Licata was awakened by a knock on his front door. Suspecting no evil, he lazily walked over to the front door, and quietly asked, who is it? “It’s me Jim”, came the reply. Mike Licata knew the voice, he was Jim the bouncer at a Mafia owned nightclub. His car must have broken down somewhere near here and now he needs my help, he thought to himself. HE WAS WRONG. As soon as Mike Licata opened the door, Jim pushed his way in, and with a drawn gun, before he could even ask what this was all about, two others barged their way into the house. “Just what the hell was going on here", Mike demanded to know. It was only then that Mike noticed that one of the other two was carrying an axe. His thoughts quickly raced to the pistol that he kept underneath his mattress. Look Jim, you and I both know the score over here but . . . Mike kept talking as he slowly moved his way back toward his bedroom. But it was too late the axe fell. However, he was able to make it back to his bedroom where he tried hard to grab the pistol, but it was no good, the axe fell a second time, this time reeling him back and pinning his body between the bedroom wall and his bed. But the noise had stirred a commotion within the household. Rossalita who was in the next bedroom was now fully awake. Mike, she called, what is it? The axmen now had more work to do. The two assassins quickly went into the adjoining bedroom. Rossalita (not fully understanding what was happening) barely had time to release half a scream before she too was dead. Next came Jose. True he was only 8 or 9, but he would be old enough to tell the cops plenty. Yet more noises came from the next bedroom, “What’s going on”, a young woman’s voice called out. She soon found out. Only Victor, who had come home drunk as a skunk that day, slept through the whole thing. The fact that he was in an improvised bedroom, thus allowing him to go unnoticed by the axmen didn’t hurt any either. But at this point the axmen had more important things to worry about. A next door neighbor had walked up to the house and had begun calling out. Now the three Mafia men had to make a quick decision; make a run for it or simply keep as quiet as a mouse and hope for the best. One of the two axmen quickly took charge and by gestures told the others to keep quiet and get down. For once Jim did as he was told without any argument. The ax-man giving the instructions was obviously a pro. He knew that there was a chance that the neighbor would go back to his house and call the police, but he also knew that if they made a run for it now (with blood all over their clothes), they would be caught sure as shooting. They waited an extra 20 minutes before finally leaving. By now the experienced assassin had invariably taken charge of things. Making sure that they didn’t leave any prints, cleaning after themselves as best they could. And they didn’t run out of the house (that would have attracted too much attention), but instead calmly walked out. As Mike had conveniently left the keys in the door lock when he had opened it, one of them even made sure that he locked the front door on the way out. And just in case one of the neighbors was still looking out his window, he even waved goodbye to the Licata’s as he was leaving. A professionally done job he thought, bloody enough to send a message loud and clear. Don’t cross the Mob or else. His only regret being that he had to leave his favorite axe behind. Couldn’t take a chance of being seen carrying it around, not just now. But no biggy, he had lost axes on his jobs before, and in any case, he had a relative who owned a hardware store anyway. As one can imagine the possible scenarios of what happened that night are endless. I’m sure that the reader can readily imagine one of his own. Thus the three above simply being (in this authors opinion), the most likely. Victor Licata only weighed 113 pounds at the time and was considered to have been in poor health. Mike Licata’s body was found, “pinned between the wall of his bedroom and his bed”. Note: This is a 1930’s metal frame bed, (see picture) itself weighing more than 40 pounds easily. Both the front and back doors were found locked from the inside. [17A] -- From the various newspaper articles at the time, it appears that some reporters were able to snap some pictures of him while at the county jail, and it can be assumed that they were also able to ask some quick questions, but that would have been about it. "Report of the Secretary of State of the State of Florida"
[17E]-- MUSEUM NOTE: The name Licata is the Italian equivalent of ‘Smith;’ There is even a small city in Sicily somewhere named Licata. Thus we should not think it odd that this name pops up a lot.